Hanoi Capital is located in the Northwest of Red River Delta. Endowed by the nature, Hanoi possesses a typical climate of the Northern with four distinguished seasons in a year: Spring, Summer, Autumn and Winter. Type of climate tropical monsoon has much influence on Hanoi, so the most significant feature of Hanoi Climate is the comparative difference between the hot and the cold season. Also, due to the impact of the sea, the humidity and rainfall in Hanoi is rather high with the average number of 114 rainy days per year. The name of Hanoi is also interesting to tourists. 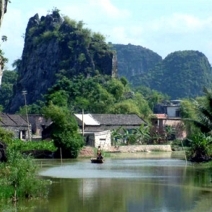 Literally, Hanoi means “the hinterland between the rivers”. (Ha: River and Noi: Interior). Actually, the new Hanoi (including Hanoi, Ha Tay Province and some parts of Hoa Binh and Vinh Phuc Province) is embraced by two rivers: Red Rived and Day River. Therefore, Hanoi is considered as the city of lakes – the trace of ancient rivers. Interior Hanoi city, there are about 18 beautiful lakes of which the West Lake is the biggest with the total area of about 500 hectares. All the lakes are the lungs of the city which play an important part in making the climate equable for all parts of Hanoi. Besides, the surrounding gardens and trees also provide this city with a vital source of energy. Hanoi - the antique dynamic capital of Vietnam has been undergone nearly 1,000 years and witnessed all the ups and downs of Vietnamese history. After two Great War against French Colonial and American Empire, Hanoi is now significantly recovering from the destruction of the Wars. A whole new look is brought into the city with the appearance of many wide avenues, highway, hotels and office buildings. 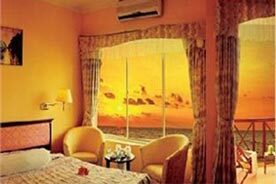 However, nowadays, Hanoi still keeps inside many of the historic vestiges which are the “most-wanted” tourists sites for foreign tourists whenever having chance to travel to Vietnam. All of these sites are the pride of Vietnamese people in general and Hanoians in particular. When mentioning the name of Hanoi, not only Vietnamese people but also Westerners is familiar with the phrase “Hà Nội 36 phố phường” (means Hanoi 36 districts). In the past, each street specialized in a particular trade. That explains why Hanoi has the name of 36 districts. At present, although many of the streets no longer have the products for which they were named, some still keep its trade for earning people’s livings. All streets are gathered in Hanoi Old Quarter – which is situated near Hoan Kiem Lake in the heart of Hanoi. 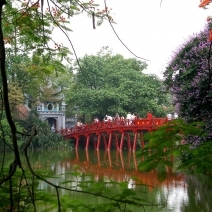 Hanoi is one of the most famous tourist attractions of Vietnam. 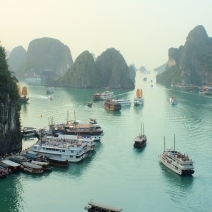 Thanks to the geographical location, Hanoi has favorable conditions to connect with other parts of country, even international countries. It is proudly recognized as “The City of Peace” by UNESCO in 1999. Hanoi is worthy a center of politics, economy, culture and tourism of Vietnam – one of the most interesting capitals all over the world.